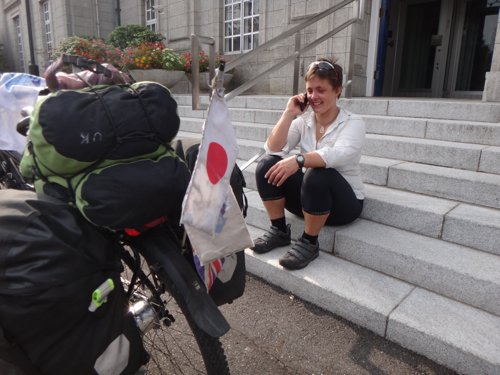 My two faithful steeds from London to Tokyo - Hercules the bike and Nelson the kayak. Meanwhile, I am due a sleep and a G&T. More stories from in a wee while. PS Another very happy thank you to the British Embassy here in Tokyo for their support and especially Mike Sims-Williams for escorting me into Town today and accompanying me the last couple of days. wow, i am glad you made it to japan and love your pic’s of local people. What lovely carm sea’s are there.Do make the most of your rest time. Whoop whoop whoop!!!!!!! I am so pleased for you. Daddy would be so proud too…..and Taid and Broni would just be so relieved that you are safe!! !….as was Joyce this morning when I phoned her to tell her. The dogs send you a lick and a woof!!!! Well done Sarah on completing this first part of your wonderful trip. We shall look forward to the next part in due course but do enjoy your time to rest and recuperate etc. We are all so proud of you having achieved so much in such a short time. Amazing adventure. Loved tracking with you. Inspiring! Well done you!! What a star!! I should make that a pint of G and T – you deserve it. Two G&Ts sent me rather starry eyed and very happy indeed yesterday. Some more training needed I think! 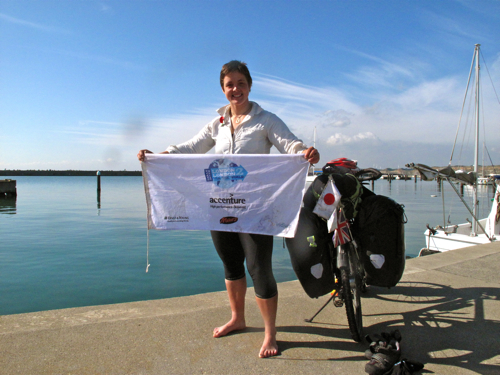 Congratulations Sarah for accomplishing the first leg of your ambitious journey! Enjoyed tracking your progress and looking forward to next year. Great accomplishments are achived by great efforts by committed minds. Not knowing what tomorrow brings is what drives the soul to continue onward. Award yourself some time off and SEVERAL G&Ts – you have earned both!!! Congratulations on your fantastic achievment of reaching Tokyo. 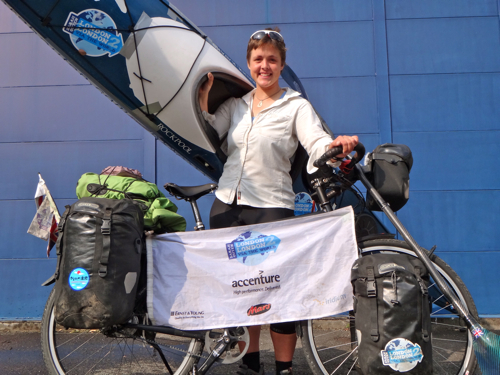 It’s been brilliant following your adventures over the last 7.5 months and 18,700km of cycling. Enjoy your rest time. Looking forward to following you on the next leg of your journey. I only came across the fabulous ‘Outs’ by chance. I was looking to buy a touring bike and via Thorn, Koga, Woodrup and finally Santos I came across Sarah’s trip. Initially I was just impressed by the bike and how well it was holding up to the trials and tribulations of Sarah’s ride. Now its the progress of Sarah on her mammoth trip that is the most interesting. Well done girl! Congrats! You’ve accomplished something very few people will ever do in their lives – be proud already! What do you have planned for the winter? Hi Lovely Looney, I just found your site and think you and your trip are fabulous! Good luck and remember a G&T is always better with a quarter lime rather than a flacid slice of lemon! 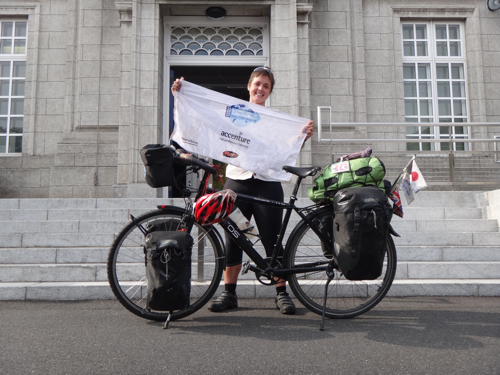 An amazing journey that the students in my school, Yokohama International School would love to hear about first hand. When you arrive back in Japan in the Spring 2012 would it be possible to schedule a visit to our school to inspire our students? An amazing journey that the students at Yokohama International School in Japan would love to hear about first hand when you arrive back in the Spring of 2012. Hi Dale, That sounds great – please email hello@sarahouten.com and we can fix up a date or likely date. I am in Japan until I leave in the spring so there should be plenty of time. Just had a moment to have a look at your website and see that you have successfully completed the first leg. Congratulations! I too have reached my 2011 aim, in my case the Ukraine-Hungary border, but unfortunately am still stuck here between countries after 3 weeks in a freezing lorry. The horses cannot enter Hungary due to EU restrictions on horses originating from Kazakhstan, and the Ukrainians will not let me go back – don’t even start to ask why! Still struggling to sort it out, and hope I will not be eating bread and cheese here on Christmas day. Dear Sarah, What a wonderful achievement – I have nothing but admiration for you. You are an inspiration. May you have a blessed Christmas and the most wonderful New Year, as you travel homewards. Fantastic is what you are! Enjoy some time to sight see – slow time…. Well done! another tick in the box.